40 Kinds of Wings & Wicked Crab Cakes…Okay, I can Die Now! Chris Shuppy began his career in the service industry when he was hired as a server with The Gingerbread Man in Harrisburg in 1986. After some time, he was promoted to a manager and continued to manage that location for almost ten years. Deciding to go out on his own, Chris purchased the Highspire Diner with his parents, Anne and Pete. 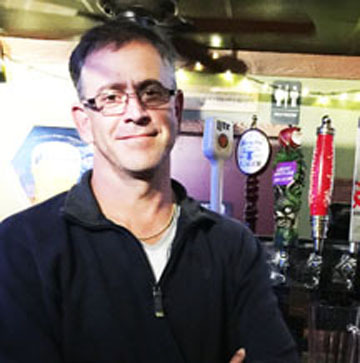 After seventeen years of owning the diner, Chris wanted to try his hand at the bar and restaurant area of the industry and in 2011 he purchased Nathan’s Bar and Grill. When Chris bought Nathan’s, it needed a lot of work. Luckily, he had previous experience in construction and was able to do most of the renovations on his own or with little help. Since remodeling the bar and dining room, Chris has seen an increase in business. He also attributes this increase to their great food! He went on to say that he has “the best crab cakes. I would put them up against anyone in town.” In addition, they also serve a number of seafood items, hand cut steaks, over 45 flavors of wings, and desserts made by Chris’s mom, Anne. With a smoke-free dining room and smoking bar, Nathan’s has been able to please every type of customer. What else keeps them coming back? Nathan’s has free darts on Tuesday, karaoke Thursday through Saturday, the NFL ticket and a number of other food and drink specials. Since opening his business, Chris has been a big supporter of giving back to the community. In addition to donating to the Fraternal Order of Police every year, they also take a big interest in the East Pennsboro School District. They continuously donate to everything from athletics to the Education Foundation, as well as to any seasonal fundraisers. Most recently, they held an event where employees donated their tips to help Ovarian Cancer patients pay for medical treatments. To see more about Nathan’s Bar and Grill, please visit www.nathansbarandgrill.com.